"The 2015 Premier Innovation Celebration was held on Tuesday night. Over 3,000 attendees, and must have had over two dozen folks come up and say 'I loved your video!' The coordinator of the event for Premier told me that he had forwarded the video to a number of folks in their office prior to the event and said that the overall consensus was that “if this isn’t the best video we have ever received for this program, it is certainly one of the best!" See Insorb's Innovation Award win here. "The video acts as our spokesperson. It gets passed around in ways no other materials do." BlessingWhite, a world leader in Employee Engagement, sought out a premiere studio to illustrate and animate their X Model of Engagement. They wanted to expand the reach of their popular diagram from a drawing on paper to a viral video that would distribute itself on the internet. To put it another way; they wanted high entertainment value, very low cost, and maximum return value. And that is just what they got. Soon after making the explainer video, the X Model of Engagement became a salesforce on its own. "Whiteboard helped us bring an important concept to life. The animation is now our calling card; it gets people familiar with what we do before we get to meet them face to face." "Whiteboard’s animation allowed us to get a fundamental concept out there in a way that is clear and engaging. Now the video acts as our spokesperson and gets passed around in ways no other materials do." Marlow and the team at BlessingWhite were pleasantly surprised when the video went from 50,000 to 100,000 to 500,000 views. It currently has 750,000 views on Youtube. "It’s well over this number when you add up the different versions and the webviews off our web server." "What started out as a way to communicate a concept has now grown for us – this animation is used in dozens of different venues, from client presentations to conferences to client intranets. Short of an in-person presentation, there isn’t a more powerful medium." They believe that aligning employees’ values, goals and aspirations with those of the organization is the best method for achieving the sustainable employee engagement required for an organization to reach its goals. Full engagement represents an alignment of maximum job satisfaction (“I like my work and do it well”) with maximum job contribution (“I help achieve the goals of my organization”). The index they use to determine engagement levels contains items that reflect the two axes of contribution and satisfaction. By plotting a given population against the two axes, they are able to identify 5 distinct employee segments. "OMG! It’s so beautiful! You guys are getting tons of compliments on this piece." “Everyone is really happy with this video and I must admit, I got teary eyed when I watched it." PetSmart returned to create 2 more videos with us over the span of 2 years. 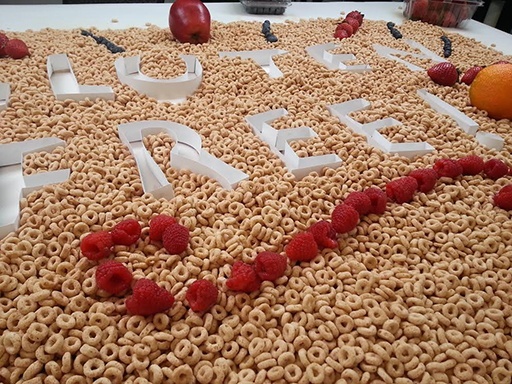 General Mills believes that Cheerios should be enjoyed by everyone. With approximately 1% of the population suffering from Celiac disease and up to 30% of the population avoiding gluten, General Mills wanted to make the shift to remove gluten from Cheerios. This would allow a large part of the population to fully enjoy the cereal. "I loved the final product! It’s great and received a very positive response on our Facebook page." By simply removing stray wheat, rye and barley grains from the Cheerios oat supply, General Mills has made the Cheerios we all know and love gluten-free, while maintaining the same great taste. And we couldn't help but devour the final result. We made 5 videos with Cheerios over 2 years. "The Explainer video you made for us is getting a ridiculous number of hits on Youtube and Facebook." "Your Explainer video has generated a huge amount of leads for us." Our studio’s relationship with Echo 360 began with their marketing expert Richard Taylor. Richard Taylor was Senior Vice President for Brand Marketing at AOL where he pioneered innovations in advertising and media that leveraged online, social marketing, and product integration. Richard also served as Vice President of Global Marketing at Burger King where he established the company as the leader in entertainment marketing. Early in his career, Richard worked as a marketing executive in the beverage industry where he lead international brands such as Martini & Rossi and Bacardi. Echo 360 uses explainer videos for their organization in various ways, such as their homepage video, on social media, on youtube, at conferences, at private meetings, in email blasts, or their sales team can play them on their smartphone at an airport. Each of these means has proved successful. The combination of a great product and a great explainer video equals success! And Echo 360 has great service and a great product. Echo360 active learning technology enhances student’s educational experience before, during and after class. Developed for educators by educators, Echo360 increases in-class participation with digital polling, provides a rich out-of-class experience by recording and sharing course instruction, and delivers deep usage analytics to help instructors gauge student progress in a course. Students watch, collaborate and participate on smartphones, tablets and laptops, wherever, whenever they choose. Echo360 was recognized with the Product Line Strategy of the Year Award from Frost & Sullivan, is CSIA-certified for outstanding customer service, and was named a Visionary Vendor in Educational Technology by IT research firm Basex. Echo360 is backed by Revolution Growth.